ShukerNature: SHERLOCK HOLMES AND THE SPECKLED BAND – AN UNKNOWN SPECIES OF REPTILE? SHERLOCK HOLMES AND THE SPECKLED BAND – AN UNKNOWN SPECIES OF REPTILE? According to a number of Sherlockian scholars, today, 6 January, is Sherlock Holmes's birthday - so it seemed a very appropriate day upon which to present the following ShukerNature investigation of mine. During his numerous cases, the famous if fictitious consulting detective Sherlock Holmes, created by Sir Arthur Conan Doyle, encountered a number of extraordinary creatures – the hound of the Baskervilles, the giant rat of Sumatra (click here for my ShukerNature article re this monstrous rodent), an unknown species of worm that sent its observer insane, and an exceptionally venomous, enigmatic Indian serpent referred to obliquely by one of its victims as the speckled band. But does the latter snake truly exist, and, if so, what is it? This particular story tells of how Dr Grimesby Roylott, a very aggressive medical doctor heavily in debt but with two heiress step-daughters, murdered one of them, Julia Stonor, using a most ingenious, undetectable modus operandi that he was now also secretly attempting to use upon his other step-daughter, Helen Stonor. If successful, he would retain all of their money. Although Helen does not realise that her own life is in imminent danger, she feels sufficiently disturbed by the mysterious death of her sister, who was heard to cry out "It was the band! The speckled band!" immediately before dying, to engage Sherlock Holmes to investigate. Assisted by his faithful companion Dr Watson, it is Holmes who then discovers that Roylott had murdered Julia (and was now seeking to do the same to Helen) using an exceedingly venomous species of Indian snake referred to by Holmes as a swamp adder, whose blotch-patterned body was the speckled band that the doomed Julia's last words had succinctly described. 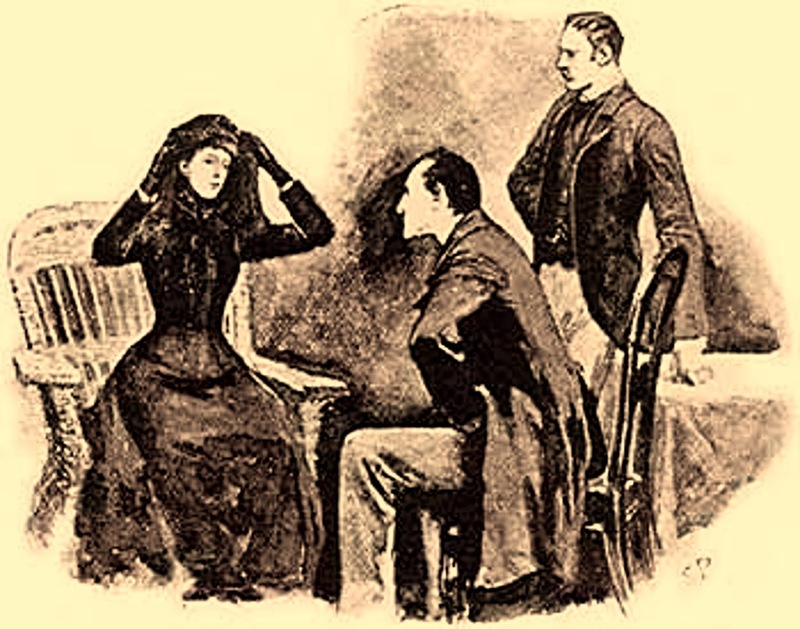 Happily, after hiding in Helen's bedroom they are able to thwart the deadly serpent, which, angered by Holmes's attack upon it with a cane, swiftly flees from whence it had come - back into the bedroom of its owner, Roylott. When Holmes and Watson then enter Roylott's room, they find him dead, with what looks at first like a speckled band wrapped around his head. Upon cautious, closer inspection, however, this proves to be the swamp adder, which in its enraged, still-agitated state had turned upon Roylott, killing him with a single lethal, fast-acting bite. In the story, the swamp adder was referred to by Holmes as "the deadliest snake in India", but what exactly is a swamp adder? 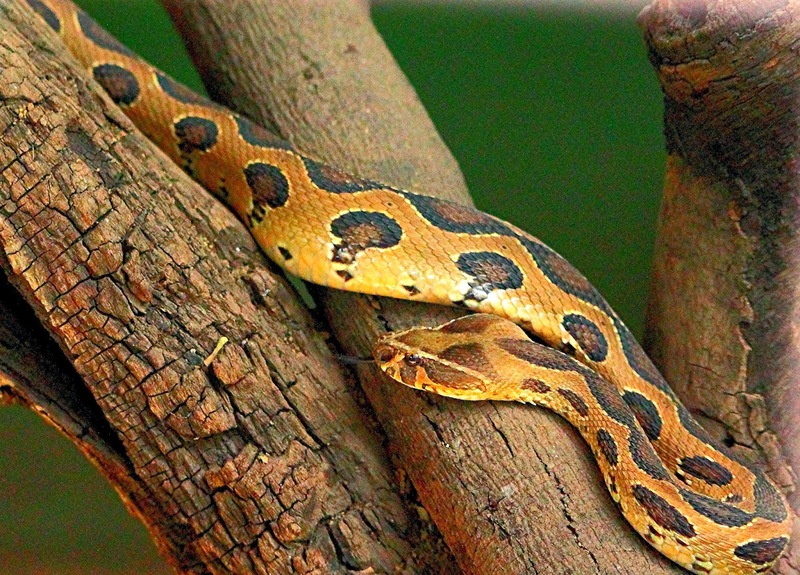 No known species of snake in India – or anywhere else, for that matter - is ever referred to by that particular name. Unfortunately, however, the story contains only the sparsest of morphological and behavioural details concerning this enigmatic serpent. Its body is yellow, patterned with brownish speckles, and probably around 1 m long but fairly slender if it resembles a band and can wrap itself around a man's head. Its own head is squat and diamond-shaped, and its neck is puffed. Its hiss is said to be "a very gentle, soothing sound, like that of a small jet of steam escaping continually from a kettle", but according to Holmes its venom is so toxic that it kills in 10 seconds. Yet its fangs apparently leave such tiny, inconspicuous puncture wounds when it bites its victim that they were not noticed by the coroner who examined Jane Stonor's body. For according to a statement made by her sister Helen to Holmes, no marks had been found upon Jane by the coroner. Down through the years, this intriguing reptilian mystery has engaged the attention of many scholars, of Sherlockian and herpetological expertise alike, with a number of different identities proposed for the perplexing Indian swamp adder. IS THE SWAMP ADDER TRULY A SPECIES OF VIPER? The most popular identity is the very venomous tic polonga or Russell's viper Daboia russelii, a large terrestrial species found throughout the Indian subcontinent. 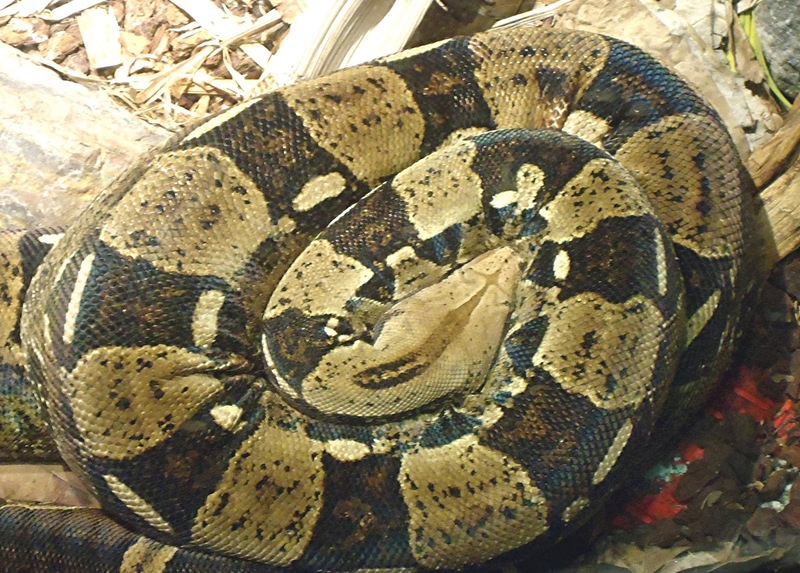 Due in no small way to its frequent proximity to human habitation, this infamous species is responsible for more deaths and incidents involving snake-bite than any other venomous snake in the entire region. 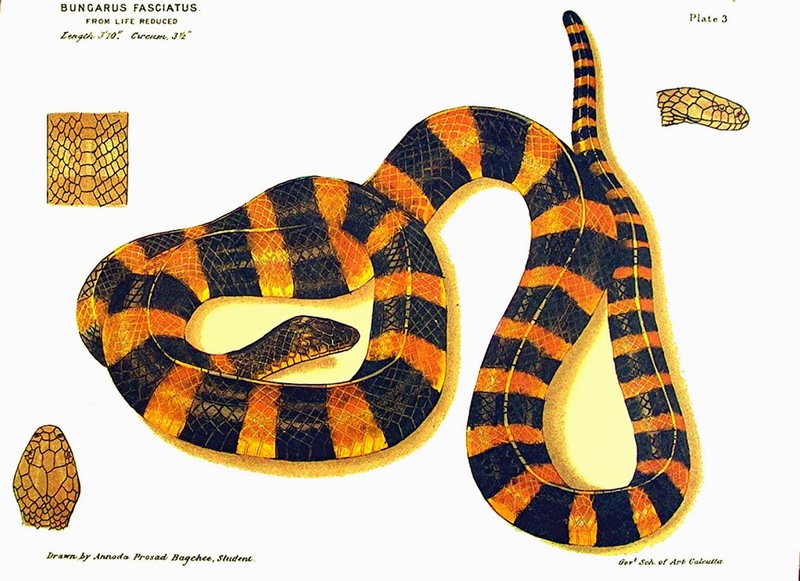 Up to 1.66 m long, its relatively slender, brown-blotched, yellow-tan body does recall the 'speckled band' description for the mystifying swamp adder. Also, as its triangular head is distinct from its neck, when viewed at certain angles its head and the beginning of its neck can collectively yield a diamond shape. However, like that of all vipers, this species' venom is haemotoxic, which is relatively slow-acting compared to the much more rapid-acting neurotoxin produced by elapids. And far from being gentle and soothing in sound, its hiss is famously loud – among the loudest hisses produced by any species of snake. In addition, its preferred habit is dry, grassy, open terrain; it actively avoids humid, swampy, marshy areas. Clearly, therefore, the Russell's viper is unlikely ever to be referred to as a swamp adder. 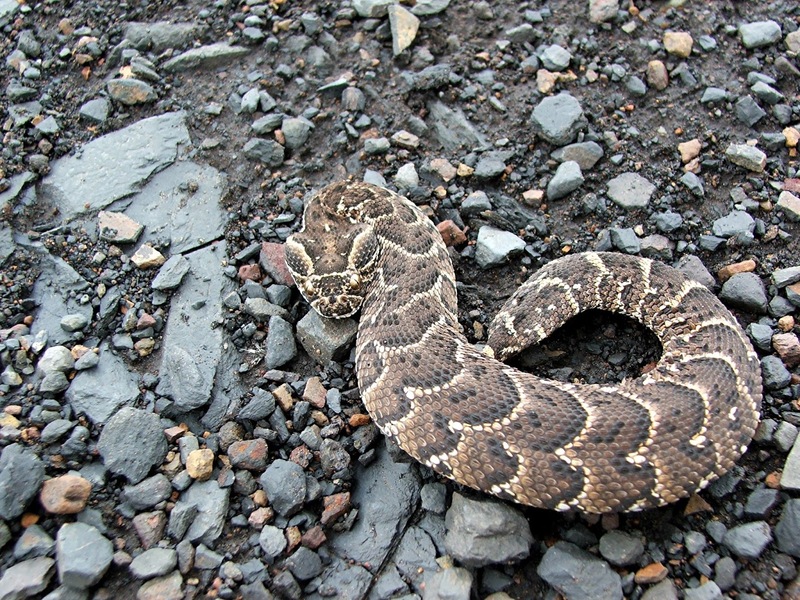 Two other viperid candidates that have also been proposed on occasion are the Indian saw-scaled viper Echis carinatus (also known as the little Indian viper) and the temple viper Tropidolaemus wagleri. 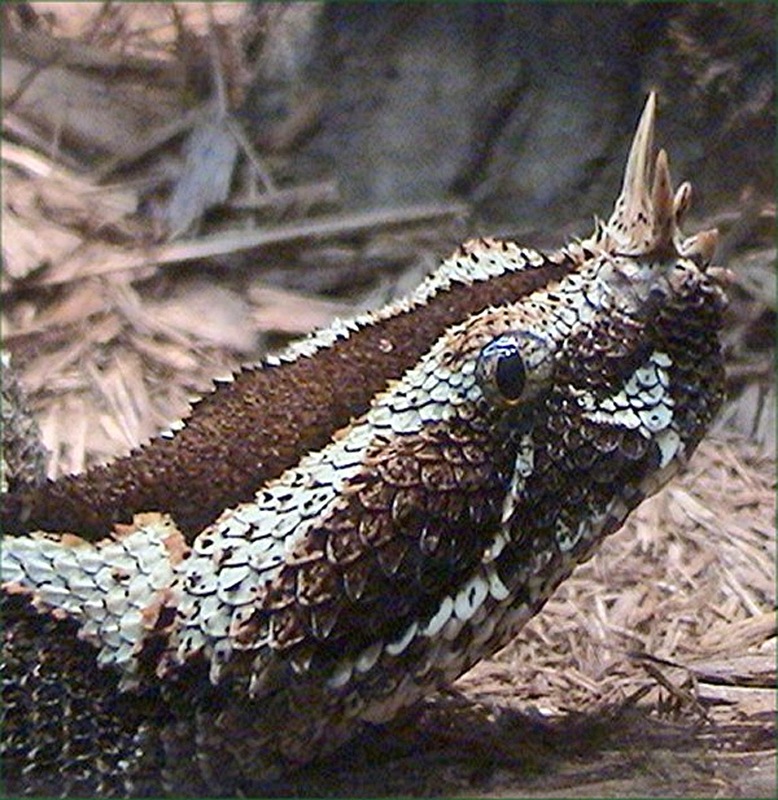 However, the former species does not exceed 80 cm (and only rarely exceeds 60 cm), and does not possess either the speckled patterning or the diamond-shaped head of the swamp viper. Also, it is an inhabitant of dry, rocky terrain, not humid swamps. 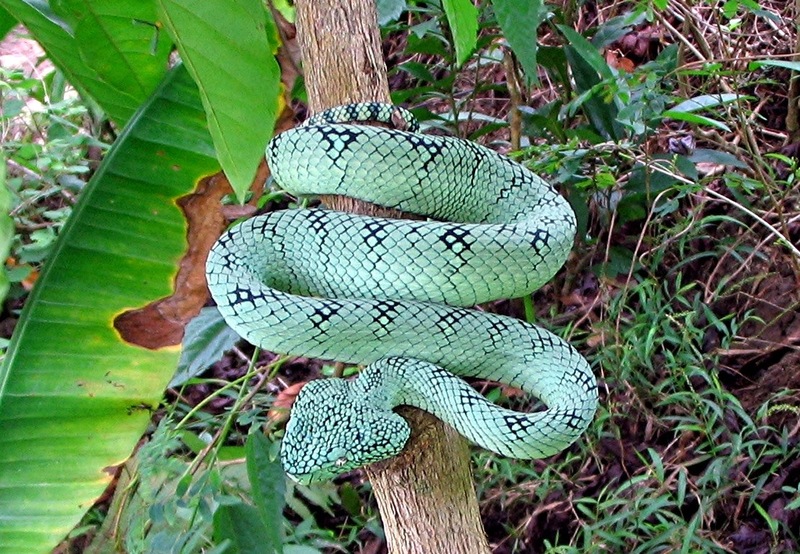 As for the temple viper: this pit viper species is bigger than the saw-scaled viper, with females growing up to 1 m long. It also exhibits a range of colour and pattern variations, but none of them includes that of the swamp adder. And, crucially, it is not native to India anyway (its distribution being confined to southeastern Asia). Neither is the African puff adder Bitis arietans, yet this too has been suggested by some as a putative swamp adder. Quite apart from its fundamental zoogeographical difference, however, the puff adder is renowned for the loudness (as opposed to the gentleness) of its hiss, and for the savagery of its bite, whose fangs can cause severe physical trauma in addition to their envenoming effects. This is a very far cry from the very inconspicuous puncture marks attributed to the swamp adder. Another exclusively African species that has been considered is the rhinoceros viper Bitis nasicornis, named after its instantly noticeable horn-like scales on the end of its nose – features conspicuous only by their absence in the swamp adder's description! Exit the puff adder and the rhinoceros viper. The common Indian cobra Naja naja is a much-touted elapid candidate for the swamp adder's identity, particularly by the late Richard Lancelyn Green and certain other Sherlockian scholars and devotees. Certainly, its neurotoxin would act more swiftly than the haemotoxin of any viper or adder. Nevertheless, it is difficult to conceive how so familiar and distinctive a snake as this one, perhaps the best known serpent species in all of India, could possibly be one and the same as the mysterious swamp adder. True, the latter's puffed neck may be an allusion to the cobra's hood (or at least a cobra-reminiscent neck expansion), but the Indian cobra lacks the characteristic speckled patterning of the swamp adder, and its head is not diamond-shaped. In fact, it looks nothing remotely like any type of adder or viper. Even more implausible ophidian identities that have been raised at one time or another include the decidedly non-venomous, non-Asian boa constrictor Boa constrictor; the extremely venomous but irrefutably Australian taipan Oxyuranus scutellatus; and a species of krait. 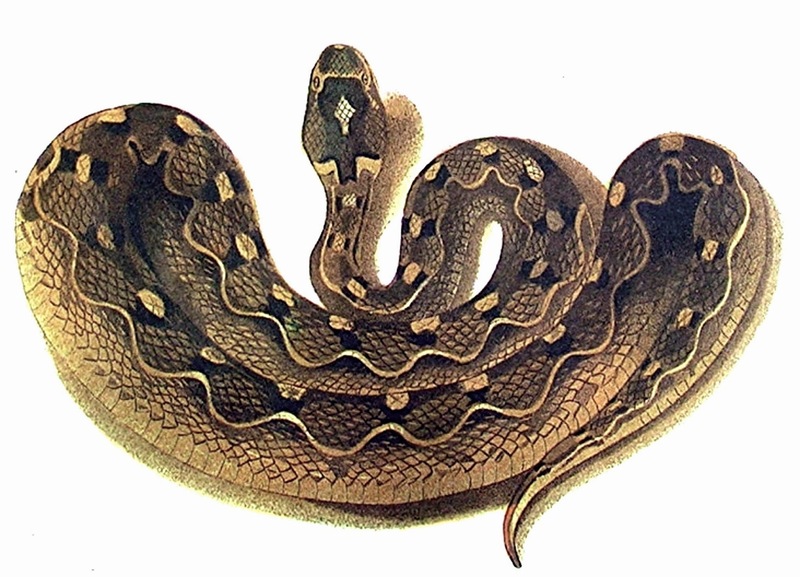 Fundamental zoogeographical differences aside, the boa constrictor notion no doubt stems from a suggestion that Conan Doyle was inspired to write his story having read a story entitled 'Called on by a Boa Constrictor: A West African Adventure', which had appeared in Cassell’s Saturday Journal, published in February 1891. Staying in a ramshackle cabin belonging to a Portuguese trader, the narrator reveals his horror at being woken by a massive snake dangling over him. Paralysed by fear, he cannot cry out, but he spots a bell hanging off a beam within reach. Although the cord to ring it has rotted away, the narrator discloses how he manages to summon help by hitting it with a stick. "We had a fine rock boa [sic] to play the title-rôle, a snake which was the pride of my heart, so one can imagine my disgust when I saw that one critic ended his disparaging review by the words, "The crisis of the play was produced by the appearance of a palpably artificial serpent." 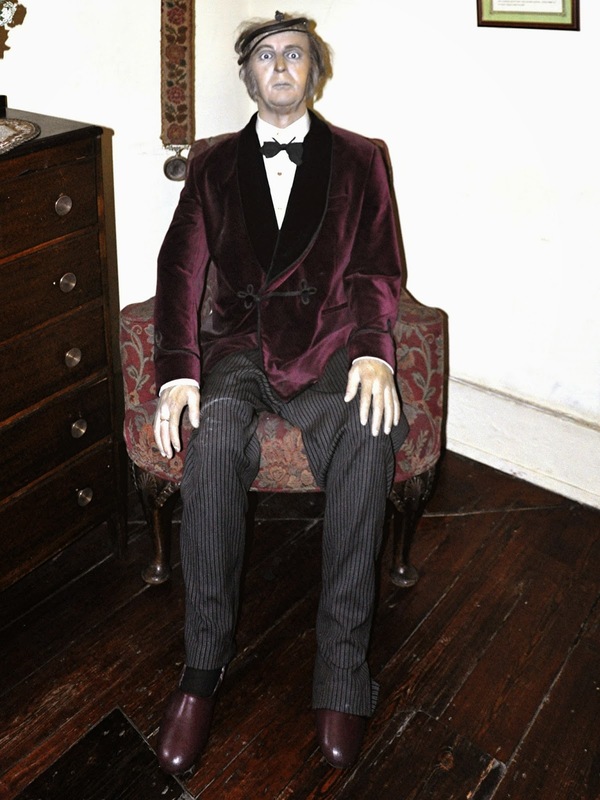 I was inclined to offer him a goodly sum if he would undertake to go to bed with it." As for a krait: it is true that certain species are Indian, all are venomous (some extremely so), and they may be encountered in damp areas. However, they differ dramatically from the speckle-patterned swamp adder with its squat diamond-shaped head by virtue of their boldly striped markings and their sleek, slender head. Kraits are also extremely timid, often preferring to conceal their head amid their coils, drawing attention away from it by vigorously twitching their tail instead, thus readily contrasting with the swamp adder's active, undisguised aggression. WHEN IS A SNAKE NOT A SNAKE? WHEN IT'S A LEGLESS LIZARD? Certainly, there are various peculiar behavioural characteristics claimed for the swamp adder that cause problems when attempting to reconcile it with any species of snake. In 'The Adventure of the Speckled Band', the swamp adder reaches its victim, Julia Stonor, by crawling through a ventilation shaft linking her bedroom with that of her murderous step-father Roylott next door, and then down a rope pull hanging directly over the bed in which she is sleeping. After it has bitten her, the snake crawls up the rope again and back through the shaft, in response to Roylott (in his bedroom) having alerted it by whistling to it! First and foremost: unless it were an exceptionally adept arboreal species, would the swamp adder be able to climb up a vertical length of rope? And secondly: as snakes are famously insensitive aurally to airborne vibrations, how could it possibly be able to hear Roylott's whistling? Consequently, there has been speculation that the swamp adder is not a snake at all, but conceivably a legless or near-legless species of lizard, belonging to the skink family. There are indeed several species of skink fitting this description, and which therefore do appear remarkably serpentine on first glance, especially to non-specialist observers. Some such lizards, moreover are native to India. And skinks, unlike snakes, can definitely hear airborne vibrations. Whether they are adept at climbing up and down vertical ropes is another matter, but in any case this otherwise ingenious non-ophidian identity is fatally scuppered by the incontestable fact that skinks are entirely non-venomous. Consequently, if a skink bit someone, they would not be poisoned by it. 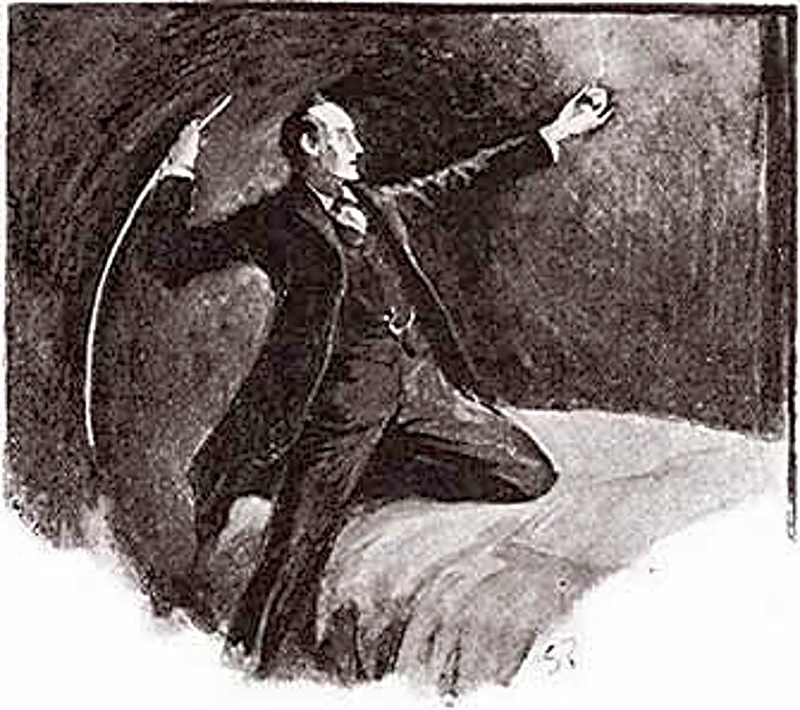 The only sensible conclusion that can be drawn from this article's analysis of the varied candidates on offer is that the swamp adder is an entirely fictitious, invented creature that Conan Doyle created specifically in order to supply his story with a supremely formidable reptilian opponent for pitting against Sherlock Holmes – an ophidian Moriarty, no less. 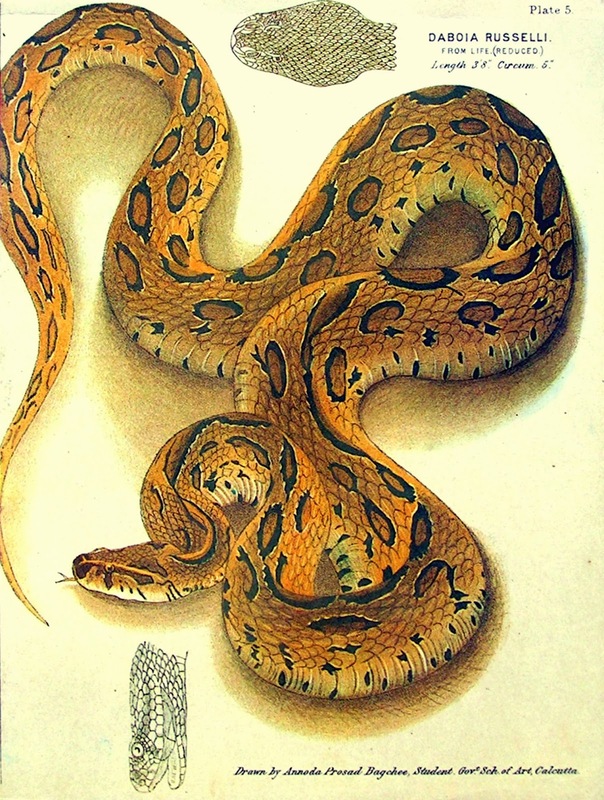 Aspects of its appearance may well have been inspired by real snakes, such as the Russell's viper's body colouration and markings, and the rapid action of the cobra's neurotoxin, but the swamp adder has no basis in reality as a valid, discrete species in its own right. However, this is not quite the end of this literary serpent's identity crisis. There is still one more identity to consider, the most astonishing of all – not only because of its particular nature but also because of where (and how) it appeared within the scientific literature. SWAMP ADDER AND MONGOLIAN DEATH WORM – ONE AND THE SAME CREATURE? In a previous ShukerNature article (click here), I documented an extraordinary mystery beast said to inhabit the Gobi Desert and known as the Mongolian death worm. According to the nomads inhabiting this vast expanse of sand, the death worm can spit forth a deadly, corrosive venom, and can also kill instantly if touched by a mechanism that sounds uncannily like electrocution. 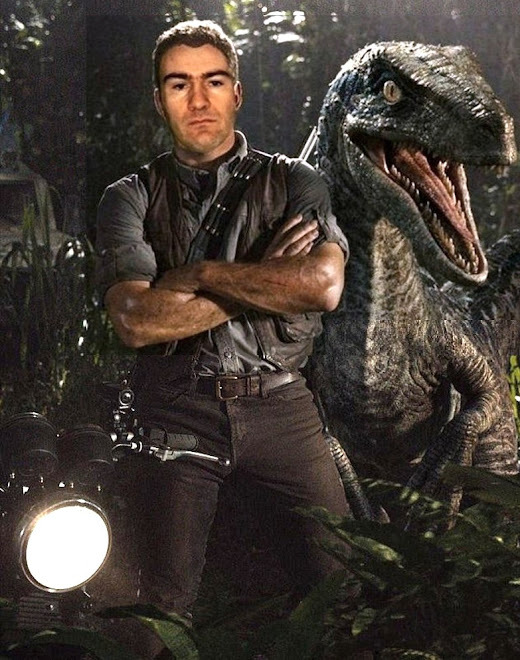 No specimen of this reputedly lethal animal has ever been made available for scientific analysis, and it may well simply be folkloric, or even if genuine merely a harmless amphisbaenian or similar reptile whose murderous talents owe more to local superstition than to physiological capability. In 1956, however, the death worm was sensationally linked to the swamp adder as the latter's bona fide identity. Not only that, it was even given a formal scientific name. The publication in which all of this appeared was a very comprehensive 238-page monograph of the lizard family Helodermatidae, which houses those two famously venomous New World species, the Gila monster Heloderma suspectum and the beaded lizard H. horridum. 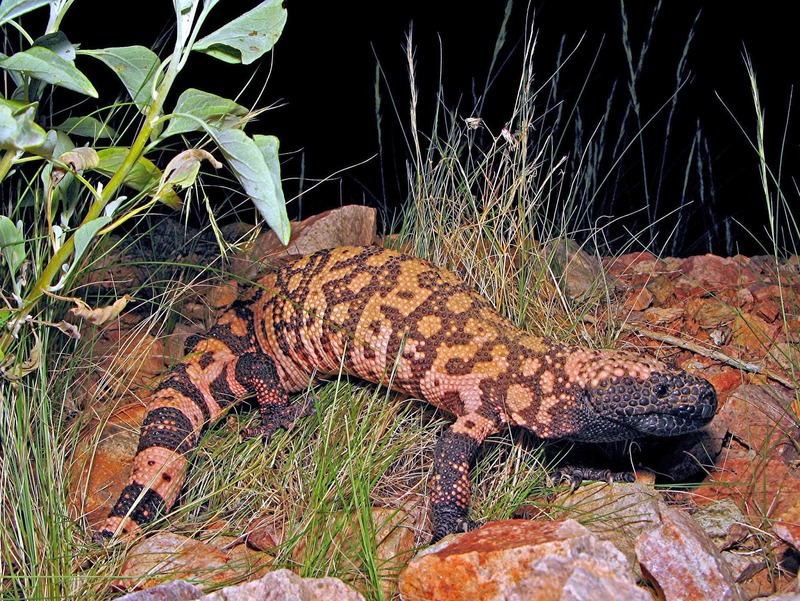 Published in no less august a scientific journal than the Bulletin of the American Museum of Natural History, and entitled 'The Gila Monster and Its Allies', it was authored by renowned herpetologists Drs Charles M. Bogert and Rafael Martín Del Campo, and as would be expected from such authors writing in such a journal, the paper was totally scientific and serious throughout – or was it? Tucked away on pages 206-209, in a section entitled 'Hybrid Origin', was a mind-boggling claim that according to a paper by snake authority Dr Laurence M. Klauber, a hybrid creature had been successfully produced in a laboratory in Calcutta, India, by crossbreeding cobras with Gila monsters! Not only that, some of these astounding hybrids had subsequently escaped, with various of their descendants yielding the allegedly highly venomous Indian lizard called the bis-cobra (featured in a forthcoming book of mine), and other descendants yielding the Mongolian death worm in the Gobi Desert! Moreover, and equally dramatic, this selfsame hybrid was also claimed to be the identity of the swamp adder in Conan Doyle's Speckled Band story. A quadrupedal lizard with the venomous potency of a cobra would, in the opinion of Klauber, reconcile all of the problems faced when attempting to identify the swamp adder with any of the more traditional identities that have been proposed. Accordingly, in their monograph Bogert and Martín Del Campo put forward an official binomial name for this hybrid, which was clearly now breeding true and therefore, they felt, fully deserved one. They dubbed it Sampoderma allergorhaihorhai – 'Sampoderma' combining 'samp' (a Hindustani name for 'snake') and the Gila monster's generic name, Heloderma; and 'allergorhaihorhai' being a name applied by the Gobi nomads to the death worm. They even included an ideogram of the hybrid's appearance. Needless to say, however, the concept of successful hybridisation between a cobra and a Gila monster is so outlandish that there was clearly more – or less – to the claims of Bogert and Martín Del Campo than met the eye, as a closer study of this particular section of their monograph soon revealed. (Moreover, the bis-cobra is also a red herring, figuratively if not taxonomically, because in reality it is a harmless varanid that superstitious folklore has conferred all manner of venomous traits upon.) For although Klauber was indeed a real-life herpetological authority and his paper regarding the hybrid also existed, it had not been published in any scientific journal but instead within an issue from 1948 of the Baker Street Journal. 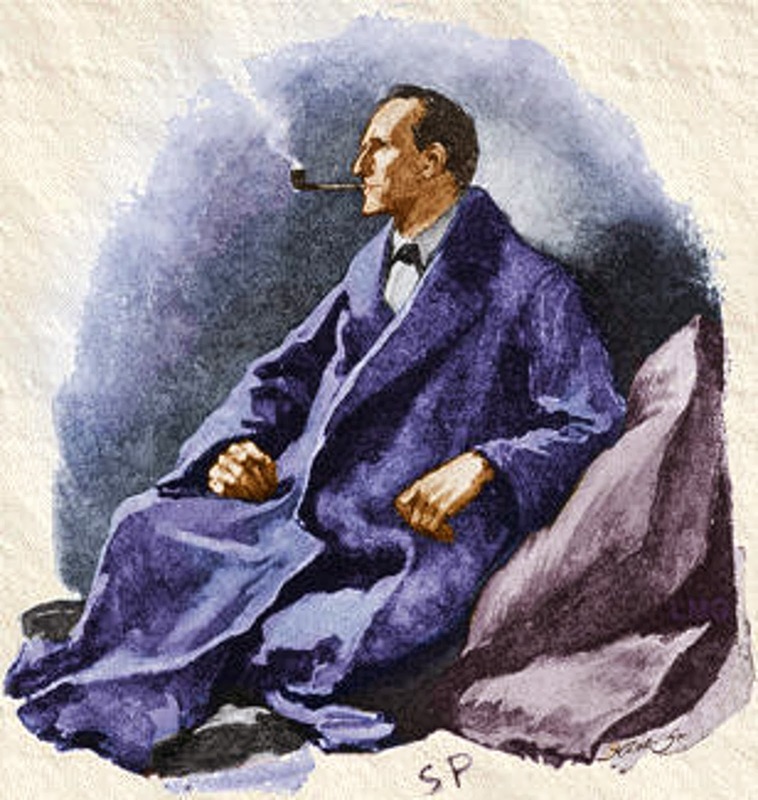 This was a periodical devoted entirely to the fictional world contained within the stories of Sherlock Holmes, and included much imaginative and entertaining but entirely theoretical speculation and extrapolation regarding various aspects of these stories' plots, characters, etc. And indeed, in his paper Klauber refers to Holmes, Watson, and the nefarious Dr Roylott as real persons, naming Roylott as the creator of the cobra x Gila monster hybrid. In short, it was all entirely tongue-in-cheek, not to be taken in any way seriously. As this is instantly apparent from reading Klauber's paper, why, therefore, had Bogert and Martín Del Campo included the fictitious hybrid in a sober, ostensibly factual manner within their otherwise entirely literal, highly authoritative monograph? According to Daniel D. Beck writing in his own major work, Biology of Gila Monsters and Beaded Lizards (2004), it was a prank by Bogert that was meant to poke fun at one of his "stodgy" colleagues at the American Museum of Natural History. 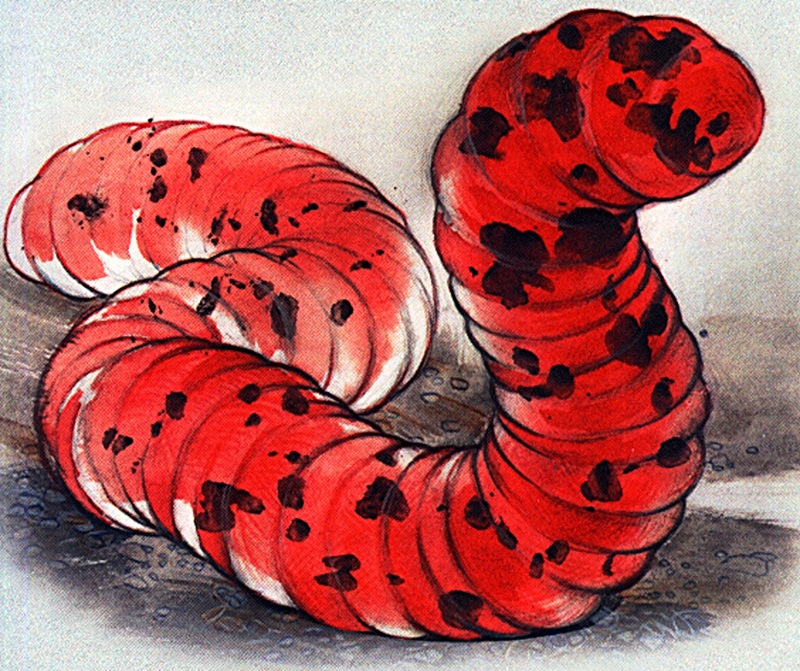 Whatever the reason, there is no doubt at all that equating it even in jest with the Mongolian death worm yielded for the dreaded Indian swamp adder (aka the speckled band) an identity so extraordinary that even the great Sherlock Holmes himself may well have been hard-pressed to deduce it! NB - all non-credited illustrations included in this ShukerNature article are (to the best of my knowledge) in the public domain. It looks like it really is fictional. What do you think of this picture of an alleged eurypterid I just came across? Is it a movie prop or tourist item? Hi Laurence, Yes, I definitely conclude that the speckled band aka Indian swamp adder is fictional. There have been a few reports of what were described as giant lobsters snatching men off ships. One was in the Indian Ocean and another I think near Nova Scotia. Interesting! I haven't heard of these reports before. Yes you have. I am not sure I can remember which books they were in, but they are among the top serious cryptozoology books. Newton's encyclopedia has sea scorpions, but he did not bring up the two cases I am referring to. He did mention in that context a case describing a giant lobster off Florida. They are older cases, say 19th century for Nova Scotia and 18th or even earlier for the Indian Ocean. Heuvelmans briefly discussed Eurypterids in In The Wake of pp. 423-5, saying, "their length was of the same order as that of the largest living crustacean: the Giant Spider-crab, or Stilt-crab of Japan, which is 13 feet across," and he says it would not be impossible that they survived. I do not find the accounts in his book. I notice that in your Prehistoric Survivors discussion of Eurypterids you did not mention these two cases. As I mentioned earlier, I haven't encountered these two cases before, which is why I'd like more details. I am sure you have read them because they are from classic sources. I just do not remember exactly and they are buried in my notes. I'll keep trying to locate them. The lobster has the man by the wrist. If you had made the connection of giant lobster-like reports to Eurypterids I am sure you would remember reading the two accounts. The sources are not so obscure as to have eluded you, of all people. In other words, I was hoping you would help me in relocating them. In any case, I am confident that Eurypterids exist in some very limited refugia at present. My interest is in cyclical evolution and from that perspective it seems very likely they still exist. With all due respect, I think that I of all people would know if I'd encountered these reports or not, and I am certain that I have not done so - they are not familiar to me at all, sorry. 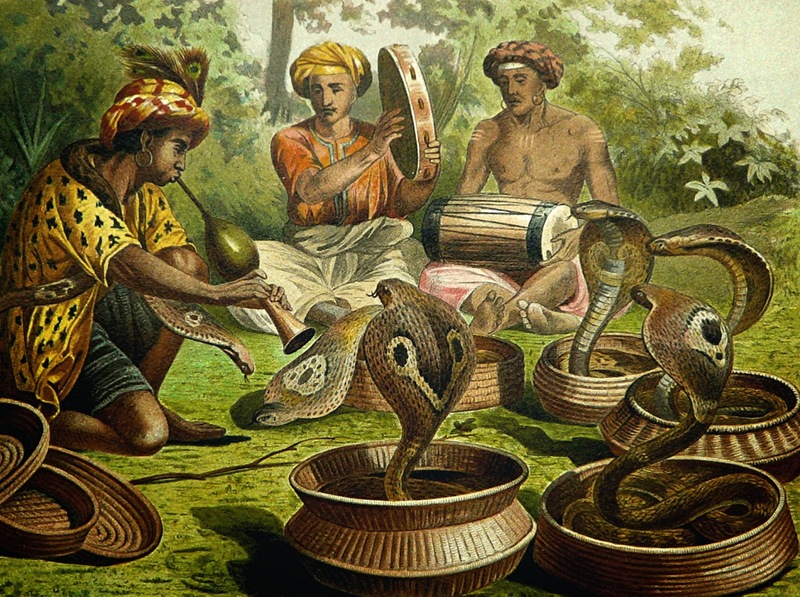 I was wondering where you managed to find the 19th century colour paintings of the russell viper, krait and echis? They are identical to the sketches found in Joseph Fayrer's Thanatophidia of India (1872), however in the version on archive.org they are only available in black and white. I would greatly appreciate if you would share a link to where you found the colour versions, as I am eagerly seeking to find a colour picture of the cobra. Another problem with the Speckled Band is that almost no kind of snake is known for pursuing people. So the idea of Roylott "turning it loose" on Helen Stonor - not by tossing it at her, but by "sending it" to her - is pretty far out. Even the idea of it attacking HIM when it gets back to him (unless they literally ran right into each other) seems unlikely. When I read the story, I've always thought the swamp adders description sounds a little similar to Russel's Viper (known as Thith Polanga in Sri Lanka, literal translation spotted viper). The spots instead of rings rule out the Kraits, one of which are the most venomous in the country. However I recently learned that a snake locally known as Kunakatuwa (or Polon Thelissa), Merrem's hump-nosed pitviper (Hypnale hypnale) is now listed as one of the 6 highly venomous snakes in the country. It's the snake causing the highest number if bites in the island and may also fit some of the description. It has the dirt like color, darker spots, diamond-shaped head, and known to flatten the body when felt threatened.